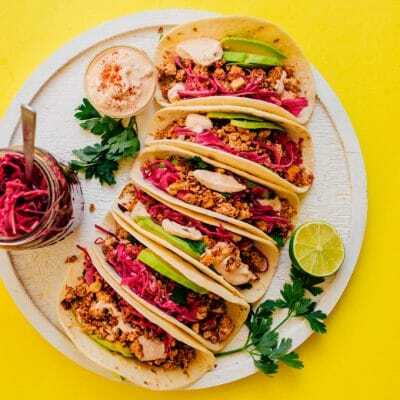 These Soyrizo Tacos are stuffed with homemade vegan chorizo and quick pickled red cabbage, topped off with a smoky adobo crème. There are a surprisingly high number of really delicious ready-made vegetarian products here in the Netherlands. Soyrizo is not among them (specifically, the soyrizo sent from heaven that’s sold at Trader Joe’s). So when the taco cravings hit recently, I set to work on creating a homemade soyrizo that might fill the void. And with just a handful of ingredients and some crumbled tofu, this homemade soyrizo hit the spot! What is soyrizo made of? 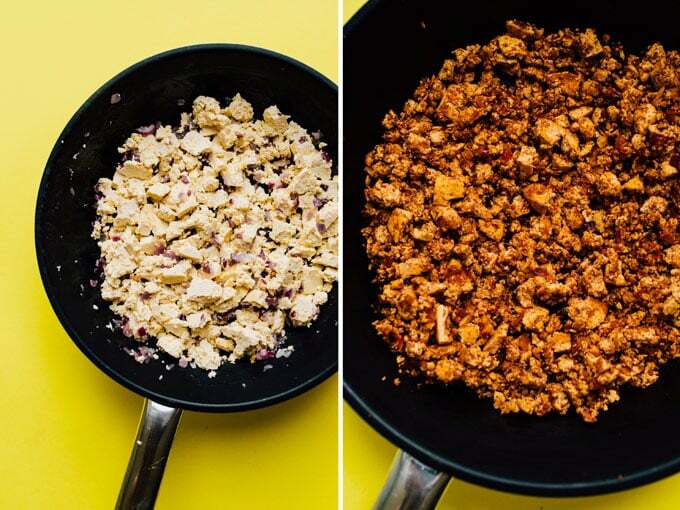 What is soyrizo? It’s the vegan version of chorizo, a spiced ground pork sausage. This soyrizo recipe is made with firm tofu for that crumbly texture, a blend of spices, and tomato paste to deliciously glue everything together! It’s ready in minutes and is perfect on sandwiches, wraps, salads, and tacos. 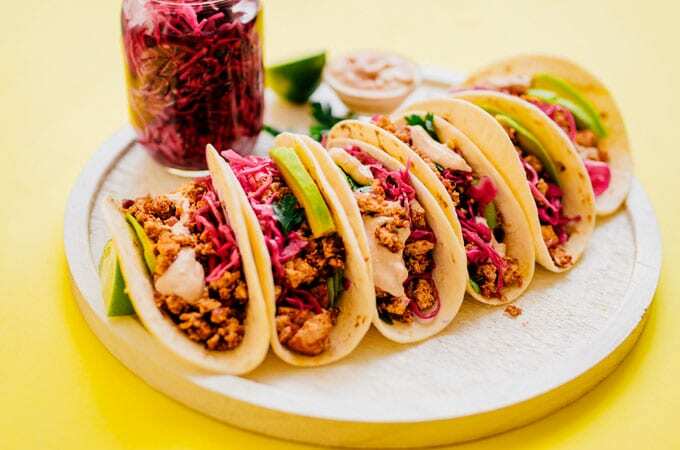 We’re topping these soyrizo tacos with a quick pickled red cabbage inspired by the taco brunch bars I used to go to in San Antonio. 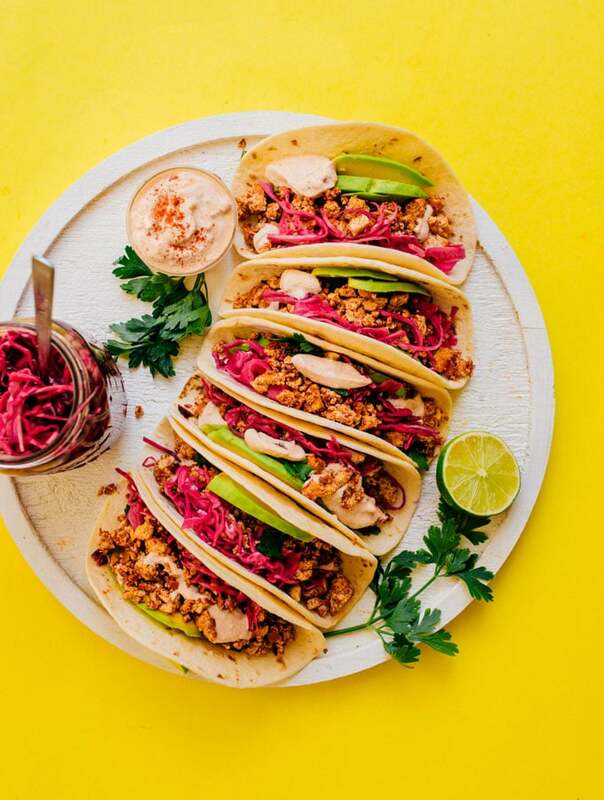 They add color, crunch, and zing that take these tacos to the next level. Finally, the adobo crème is an easy combination of adobo sauce, yogurt, and lime (because no taco is complete without a good sauce). Prep: Combine all adobo crème ingredients in a small bowl. Press water from tofu by wrapping it in a few layers of paper towels and gently squeezing. Crumble into rough chunks. Cook: Heat oil in a large sauté pan over medium heat. Add onion and garlic, cooking until onion softens and becomes translucent, 3 to 5 minutes. Add tofu and the spices, increasing heat to medium/high. Cook, stirring and crumbling tofu until it begins to brown. Stir in tomato paste and vinegar then remove from heat. Taste and adjust seasonings as needed. 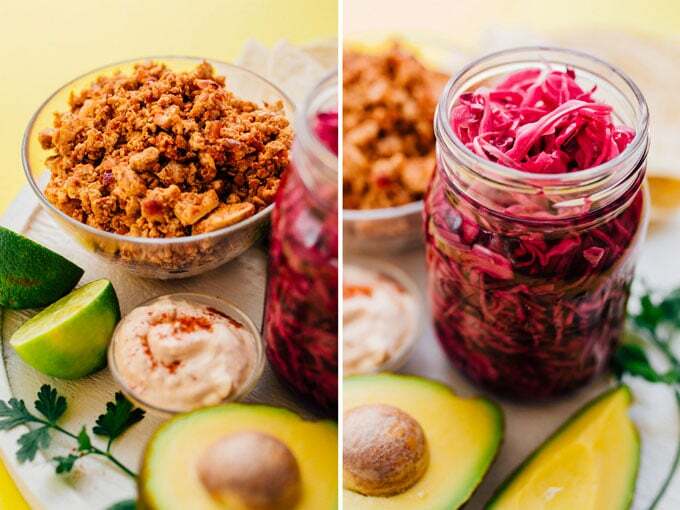 Serve: Serve soyrizo warm on tortillas, topped with adobo crème, pickled red cabbage, avocado, and cilantro.